I can't tell you how happy I am that the Dorista's are making something soft this week. You see I had gum surgery last week and my two favorite things to do have been limited: talking and eating. Coupetade is a traditional Southern French dessert that takes it's name from the dish it is usually baked in a coupet. No one in my family felt this was a dessert. It struck us more as a brunch dish. I think it is an excellent Sunday breakfast for a large group because you can bring a big plate of French toast to the table ready for everyone to eat. 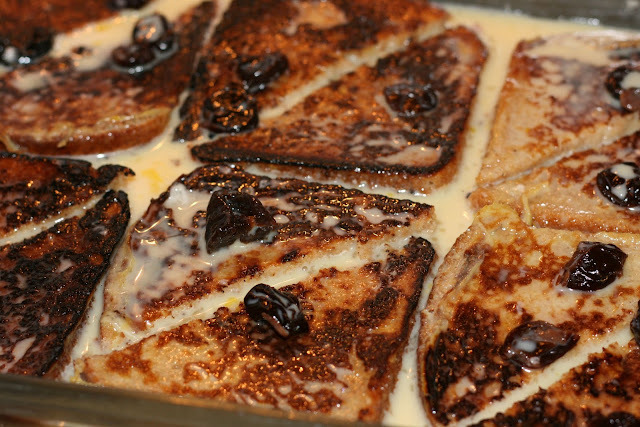 So the dish, you start by making French Toast and then you soak it in a custard and adorn it with dried fruit of your choosing. I used prunes and cherries which were delicious together. Coupetade before it is baked. Knowing that Dorie's oven is about 25 degrees warmer than mine I baked the Coupetade at 350 degrees for one hour instead of the 325 she recommended. I also wondered about the size of loaves of bread in France? I used a small Spelt loaf and I could only fit 6 slices in the 9 by 13 inch pan she instructed us to use. Coupetade right out of the oven. The result was a really tasty French toast that my whole family enjoyed: prunes and all, but to call it a dessert... it just lacked a certain Je ne sais quoi. 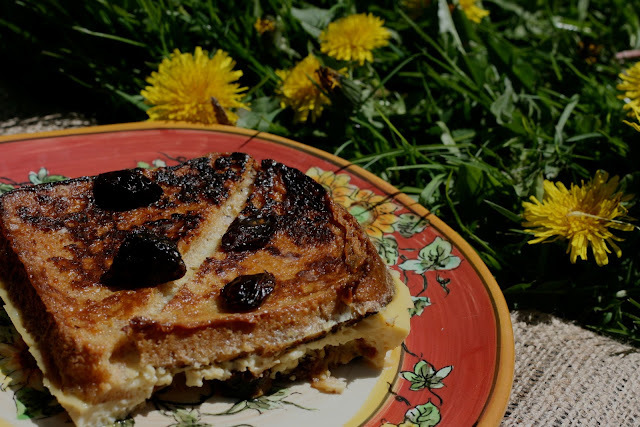 Click here for a Coupetade recipe. Storm the Beach! Cook the French Toast! So very beautiful Diane! Just totally scrumptious ad lovely! Please, PLEASE let me know how to participate in this great group! Thanks Catherine! I think it makes for a good breakfast! Absolutely, especially for a large group. Too sweet for breakfast for my family. The prunes would have them hiding! I put cherries too in mine they aren't sweet and most people like cherries. Dorie's oven is different? That explains why mine was bordering on overdone after 1 hour! Hmm... Another reason why I pay little attention to 'done times' in any recipe and instead hover. Yes, Dorie's oven is different, but I want hers... it is very large and professional. yours looks so cool! tiled, sort of! :) Love, love! They did make for an interesting picture... would work well as a funky wallpaper. I like the look of your slabs of coupetade on a plate like a very delicious sandwich - I could definitely go for that. I felt like I was eating more of sandwich than a pudding that's for sure. I enjoyed this for dessert, but if I make it again, it'll be for a big crowd at brunch. I think I will do the same. I have a big brunch once a year and this will be perfect. I left the fruit out of the pudding and added fresh fruit as topping instead. I just couldn't convince myself that prunes would be a good addition. Happy to hear that someone tried them though. I always associated prunes with old people who need more fiber, but Dorie has shown me that they are a really versatile fruit that works for both sweet and savory dishes. I wish I had prunes in the house, but they were all gone. This worked as dessert for me, I'm not fond of sweet breakfasts. Yours looks wonderful. I bought such a big container of prunes I need to make that Moroccan like chicken dish again. Glad you like the coupetade as a dessert. crowd. Hope you are feeling better and will be able to eat soon. Have a lovely Mother's Day. I got some of my stitches out and can chew a little better... what a pain in the mouth, but hopefully it will be worth it in the long run. Dinane, so nice that your family enyojed your fabulous looking Coupétade so much and I am impressed that they would all like prunes, now that particular ingrdient is a hard sell at our house - it does look really delicious though! Take good care of yourself and have a wonderful Mother´s Day weekend! The way to sell prunes is not to mention them and cut them up... most of the time my family enjoys eating them before they bother to ask what they are. Ouch - I am sure the last thing you feel like doing is chewing. (yes, I hid prunes in food too...) I don't think I could pass this one off as dessert in our house either. The first few days were really hard, but I am a week into it and have had a lot of stitches removed. I basically have learned where I can chew in my mouth... ah getting older so much fun! Hope your gums are feeling 100% better-it is brutal to have work on the teeth done, though you had me laughing with your "my two favorite things comment -eat and talk" (boy can I ever relate :) Your dish looks lovely and we concur it is brunch dish, not a dessert...no matter the amount of sugar that I added. Thanks Tricia... yeah, I have not had many mouth things done, but boy do you have a lot of nerves in your mouth... ouch! Chewing is getting easier. Hope your mouth is doing better, Diane. Those are my two favorite things to do, too! Eat and talk! This was a delicious dish! Yours looks mouthwatering! Oh yes, this is definitely my kind of brunch :) Gooey custardy sweet bread and fruit. I love the cherry and prune combination. 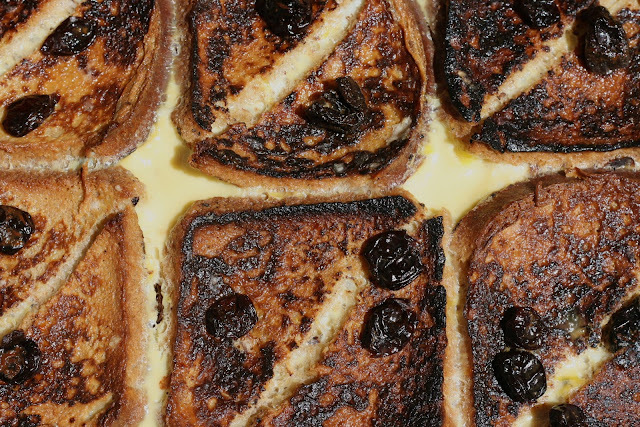 Thanks Lisa, the cherry prune combination worked really well.